The Horse & Jockey Public House on Dale Street with its entrance off Long Ginnel which led to Town End and the Police Station. The adjacent Langley’s Mill is shown on the left and Union Street in the background. The Town Hall clock can be seen at top centre. 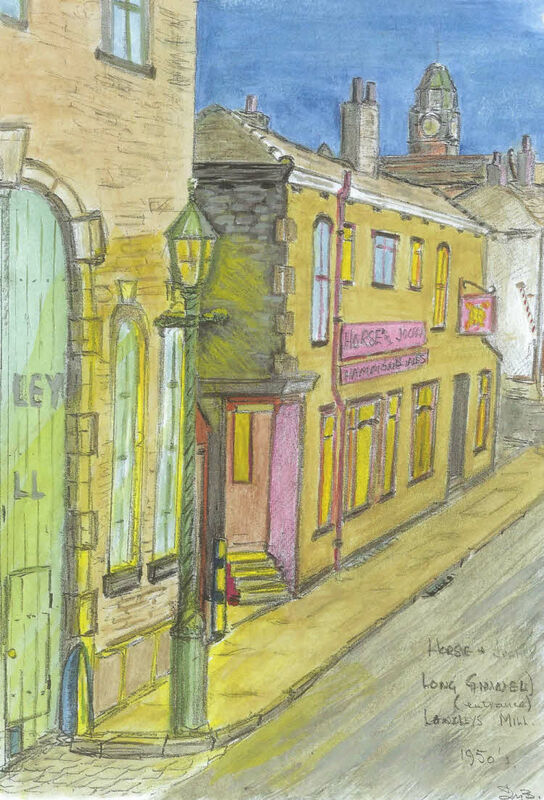 Now a Sam Smith’s house, in the 1950s, it was owned by Hammond United Breweries Limited as the sign in the sketch shows. The earliest recorded date of the Horse and Jockey was 1870 when it was owned, as a beerhouse, by Joseph Whittaker Ellis with William Smith the licencee. The Beerhouse realised £1200 in 1879 and in 1890 Nathan Elis applied for a bagatelle licence, stating that he had a suitable room, that the house was his own property, and that he had lived in it for twenty years. On the left, next to the Horse & Jockey is Dale Street Mill (later Langley's Mill).. The Langley family ran the mungo and shoddy business at the mill in Ossett and also another one in Batley until October 1869. The company was described as rag merchants, merino and mungo manufacturers in 1901 and the Langleys still owned and occupied the mill in 1915. When the Langley Brothers ceased trading, the premises were taken over for a short while by the firm of Jack Stross Ltd. of Batley who were rag merchants and shoddy manufacturers.